Guava is a neon coral color that is very neon and very hard to capture on camera. This pic is pretty close but it's even more neon in person. This is two coats without any top coat, it's not really matte but not shiny either, so I'd recommend a top coat regardless if you prefer shine or matte. This is a creme yellow with very subtle gold shimmer. It is streaky and still had bare spots even after 3 coats. It also took a long time to dry. It's pretty color, but the formula was lacking. The accent nail is Maybelline Color Show Street Art glitter topper named Wild At Heart. Glitter Matters is a very bright glitter topper with white, bright yellow, and bright pink glitter pieces in various sizes of circles and hexagons. It applied well, and only took a little dabbing, this is one coat. I'm super happy with this glitter and will use it again for sure! Zoya Storm is a black base packed with shiny silver glitter. It applies easily and is opaque in two coats. Devine! 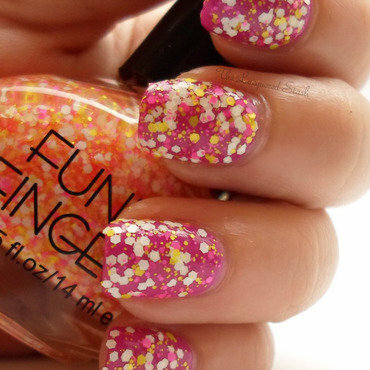 is a very pretty and deep fuchsia color that has a sheerish formula. This is 3 coats plus a coat of Seche Vite. No streaking or clumping so it had a good formula! On the Bright side is a cheery yellow orange with a sheerer formula than you'd expect. This is only two coats plus top coat but I would recommend 3 since you can still see my nail line at two coats in bright light. 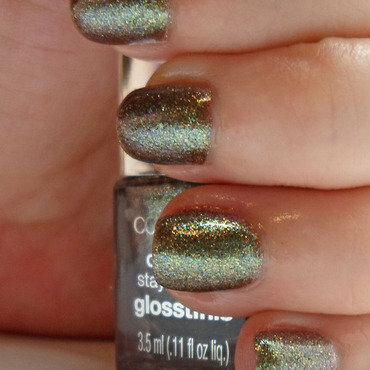 Overall I like this color and will be adding to my mani shortly! lavenbaby was opaque at one coat but took two to smooth out. The glitter was easy to apply but did take a tiny bit of fishing to load the brush. Overall I love both of these!